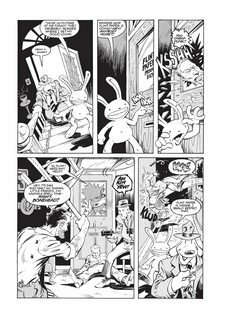 Twenty-five years ago, Sam & Max burst onto the indie comic book scene with a daring venture to the Philippines (drawn entirely without reference) called Monkeys Violating the Heavenly Temple. 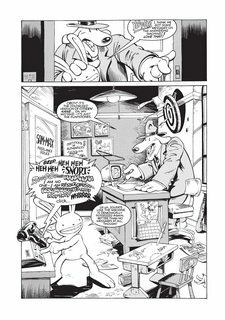 The fedora wearing canine Sam and his crazed lagomorph companion Max bust crimes on the sketchy streets of New York City as Freelance Police in this rich collection of cases, taking them from the cereal aisle of the local supermarket, all the way to the moon! In addition to all of the content of the 1995 original, this edition contains 25 pages of content developed over the last two decades, bringing the page count to 197 with 45 pages in full color. 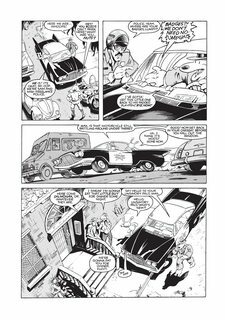 The additional content includes advertisements for the original Freelance Police comic book, a color version of Fair Wind to Java and recent paintings promoting Telltale’s Sam & Max games and the “Shout Factory” DVD release of the Sam & Max Freelance Police animated series.